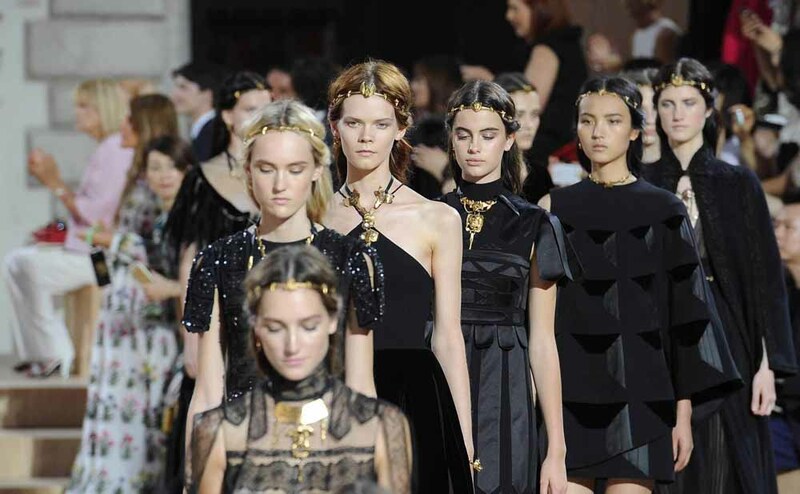 This haute couture Valentino collection is a tribute to Rome and to its beauty. The two creative directors Maria Grazia Chiuri and Pierpaolo Piccioli celebrated the Eternal City not only with a runway show but also with a multi-site exhibition titled Mirabilia Romae, a true journey into the city that has always inspired their creations for the house. This haute couture collection that sums up Chiuri and Piccioli’s unconditional love for the Capital city develops along an archaeological path in which each outfit depicts the designer’s personal vision of the city: the vertical togas bring to mind imperial glorious times, wheat stalks evoke pagan memories, the long capes conjure images of baroque Madonnas, the brocades celebrate princely splendour. This collection becomes a sort of "Tale of Tales," a Cabinet de Curiosités full of history, mystery, decadence, paganism, religion and sensuousness where nostalgia leaves room to the celebration of past beauty that can be found every day also in the city’s most secret places.